Sheltered in their sister Laura's farmhouse, the notorious band of outlaws, the Reno Brothers, terrorise the Indiana countryside, in 1866. By bribing the local officials and the corrupt judge, the brothers have the nearby town of Seymour under their thumb, however, it is not before long when someone kills a secret operative. As a result, James Barlow, a former Southern spy, agrees to infiltrate the gang by posing as a hardened train robber to bring the Renos to justice, but what Barlow couldn't foresee is that his feelings for the feisty Laura will threaten his plans for a setup at dawn. In the end, can a single man end the Reno Brothers' reign? A special agent from Chicago is sent out west to bring in the notorious Reno brothers. The notorious Reno outlaw gang ride into the town of North Vernon in Indiana in 1866 and try to rob the bank, but the good citizens have prepared a reception for them, and they manage to surprise and kill one of the gang. Forrest Tucker of "Sands of Iwo Jima" heads up the Reno gang as Frank. His brothers include Sim Reno (J. Carrol Naish of "Tiger Shark"), John Reno (Myron Healey of "Combat Squad"), and Bill Reno (Richard Garland of "The Lawless Breed"). Bill dies during the abortive bank robbery, shot dead on the plank walk outside the bank after the gang had climbed out of a high-walled wagon that they had hidden in during the ride into town. The authorities pursue the gang on horseback to the county line where they have to rein up because the Renos control the law in Jackson County in which they live. Indeed, the Jackson County authorities receive a percentage of the proceeds from each Reno gang robbery so they tolerate the brothers. Anyway, Frank Reno is furious about Bill's death because he suspected that something just wasn't right when they rode into town. Meanwhile, his sister Laura (Mala Powers of "The Storm Rider") isn't overjoyed about it either. She serves as their cook and allows them to live in the house that she inherited from her parents. Laura's relationship with her outlaw brothers ripples with tension. The Renos believe that a spy must have warned the citizens of North Vernon. Initially, Sim accuses their psalm-singing brother Clint (Denver Pyle of "The Dukes of Hazzard") of informing on them, but they discover that the real rat is Murphy (Arthur Space of "Target Earth"), a bartender in town who sends messages to the Chicago-based Peterson Detective Agency. Frank, Sim, and John beat Murphy up, tie his unconscious body to a stall in a horse stable, and torch the place. 'Cremated alive' proclaims the press when word of Murphy's death reaches the Windy City. After word reaches the Peterson Agency, they hire James Barlow (Randolph Scott of "Seven Men from Now") to lead the investigation. The Detective Agency boss tells one of his seasoned hands that he has recalled from Denver, Monk Claxton (Kenneth Tobey of "The Thing from Another World"), that he is to follow all of Barlow's orders "implicitly." According to the Peterson chief, Barlow is worth "an army of men." Western novelist and scriptwriter Frank Gruber of "Northern Pursuit" wrote the story for "Rage at Dawn" and crime novelist Horace McCoy penned the screenplay. This outdoors melodrama is another one of those movies where the hero stages a hold-up to infiltrate a gang, but Barlow plans to have the Reno brothers ask for him to join them than the other way around. Barlow is known to be "irresistible" to the ladies and he helps Laura when he meets her in the store and flashes his cash from the 'supposed' robbery. Meanwhile, Prosecuting Attorney Lattimore (Howard Petrie of "The Tin Star") and the sheriff (Ray Teal of TV's "Bonanza") visit the Reno place and question Frank about the robbery. Repeatedly, Frank assures them that the Renos did not rob the train, but Sim observes that he wished they had waylaid the train and taken the $30-thousand dollars. Frank spits in contempt at the prosecutor, and the sheriff and Lattimore leave as Laurie returns from his grocery shopping. During her shopping in town, she met James Barlow and he helped her carry her goods to her buggy. When two Reno gang henchmen tried to run the unarmed Barlow off, he roughed them up and disarmed them. Barlow is posing as a painter. Not surprisingly, when Lattimore and the sheriff return to town, they have a parley with another member of the local government, the judge (Edgar Buchanan of "Texas"), who is in on the graft and corruption, too. Lattimore is worried because their collusion with the Reno brothers is the worst kept secret in the county. Eventually, the corrupt officials get suspicious about James and Monk and drag them in for questioning. Barlow demands to see the judge and he works out a sweet deal with his honor. The corrupt officials send Barlow along with the Renos in their next hold-up and Barlow shoots the gun out of a clerk's hand during the robbery. The Renos are angry with Barlow because he forced them to flee too early, but Barlow defends his actions. Instead of letting the employees stand up during the robbery, Barlow argues that everybody should have been on the floor. Peterson and Barlow arrange for another robbery for $100-thousand dollars and Barlow informs the judge. Reluctantly, the Renos agree to ride with Barlow and Monk, but Sim threatens to kill Barlow once they've robbed the train..
"Rage at Dawn" gets off to a nimble start. Director Tim Whelan introduces us to the nefarious Reno brothers in the opening 20 minutes. After Whelan and McCoy have established the Renos' villainy and the corruption of the Jackson County officials, Scott makes his entrance. Before Scott shows up, the Peterson Detective Agency president builds him up to Monk and his son as a titan. Previously Whelan had directed Randolph Scott in "Badman's Territory" (1946). Moreover, in 1950, Scott and Tucker co-starred in "The Nevadan." "The Nevadan" had a similar plot with Scott going undercover. Ostensibly, "Rage at Dawn" is just another disposable western shoot'em up. Nevertheless, Scott, Tucker, Naish, and a veteran cast are a pleasure to watch and Whelan paces the action agreeably enough in this solid, if uninspired oater. Most of the DVD versions of this public domain western are full-screen, but you can tell from the pictorial compositions that the screen ratio wasn't 1:33.1, but was probably either 1.66 or 1.78, because characters are cut-off in the frame. Ray Rennahan's color photography gives this oater an epic quality. Beware of the PMC Corporation DVD version; the lips are not synchronized properly with the dialogue. When you say Randolph Scott, you've said it all. This is a Western, a real rootin' tootin' shootin' Western, with plenty of horses and bad guys and horses and good guys and horses and hold ups and horses. And Randolph Scott! And Forrest Tucker! 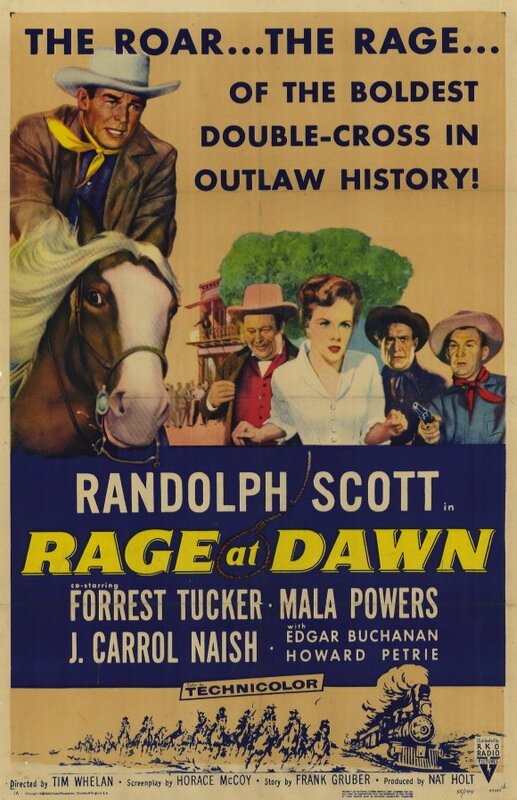 And throw in a little bit of Edgar Buchanan and some other greats, and you got yourself a real late night thriller of a Western. It's the case of the Reno Round up, only with a lot of extra fiction thrown in. At least they got the part of Clinton Reno being the good brother correct. But when you got Randolph Scott and Forrest Tucker in a Western, nothing else matters. You got the whole shebangs!